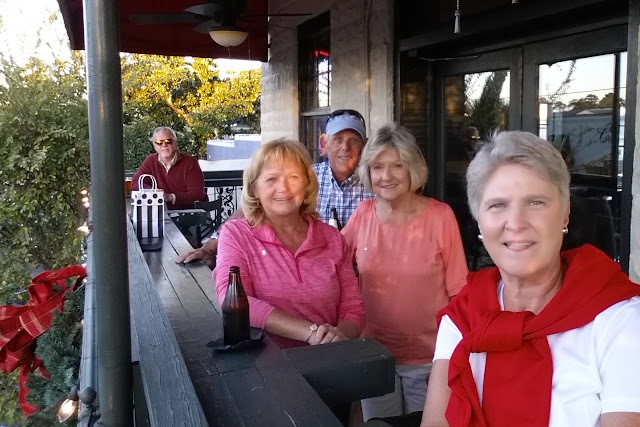 On November 19th, Charlie, Joyce, Pam, Ernie, Wayne and I drove to the lovely town of Fairhope, Alabama. It's along the eastern shore of Mobile Bay. Plain ole good luck brought us to town this day. Wet happened to be here on day of the city's annual tree lighting to kick off the Christmas season. 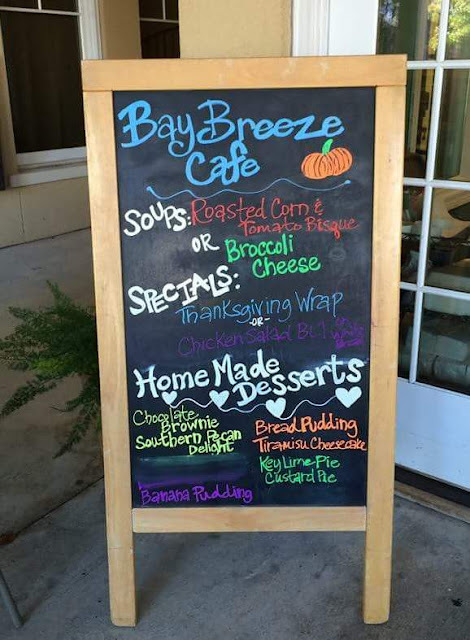 Upon arriving, we enjoyed a delectable late lunch at tiny Bay Breeze Cafe in Fairhope. We sat at a patio table where the air was cool. The sunny areas were nice and warm after lunch though.The cafe's roasted corn and tomato bisque and pecan pie were the bill of fare prizes. Clockwise: Joyce, Charlie, Wayne, Lexie and Ozzie (in the stroller), me and Ernie. Pam is the photographer. Thank you, Pam. 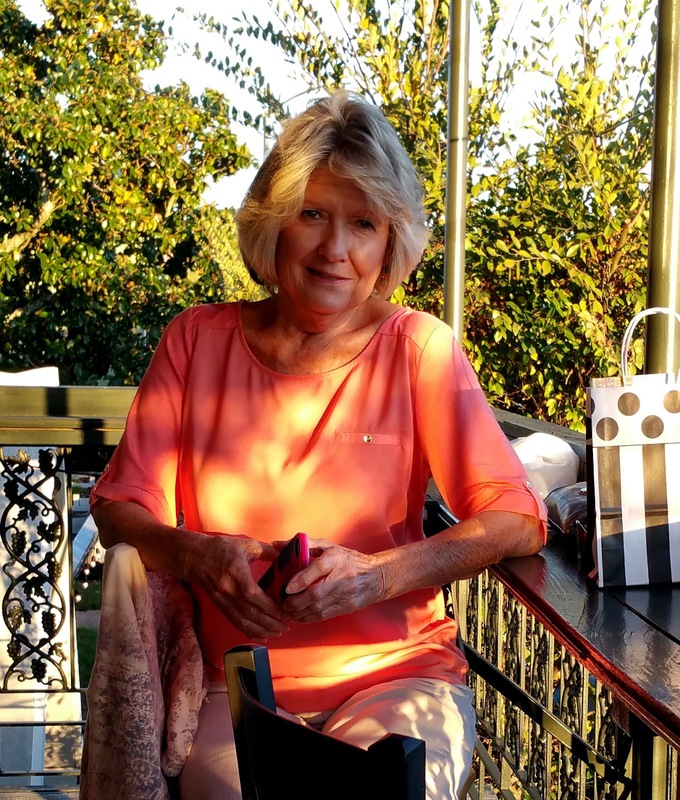 After lunch we girls began strolling the streets of downtown Fairhope, peeping into the shops and boutiques while the husbands waited patiently, finding the occasional store that interested them. 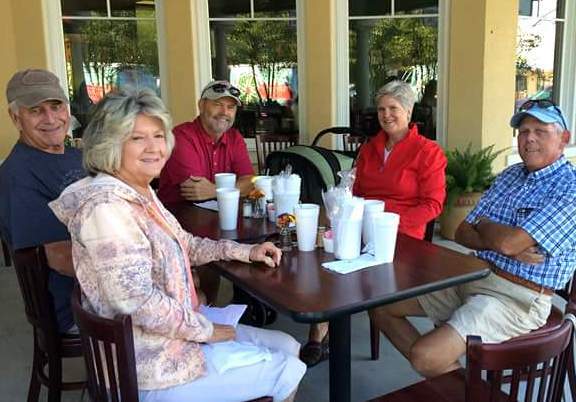 Wayne looked up an old friend, Peter Blohme,who owns several restaurants in the area. While they visited, I shopped and strolled Lexie and Ozzie, stopping long enough to buy a terrific Dr. Zhivago (fake) fur hat. Photos of it will undoubtedly be in future posts. Tourist extraordinaire, Joyce. She never tires of being a tourist and brings out the best in me. 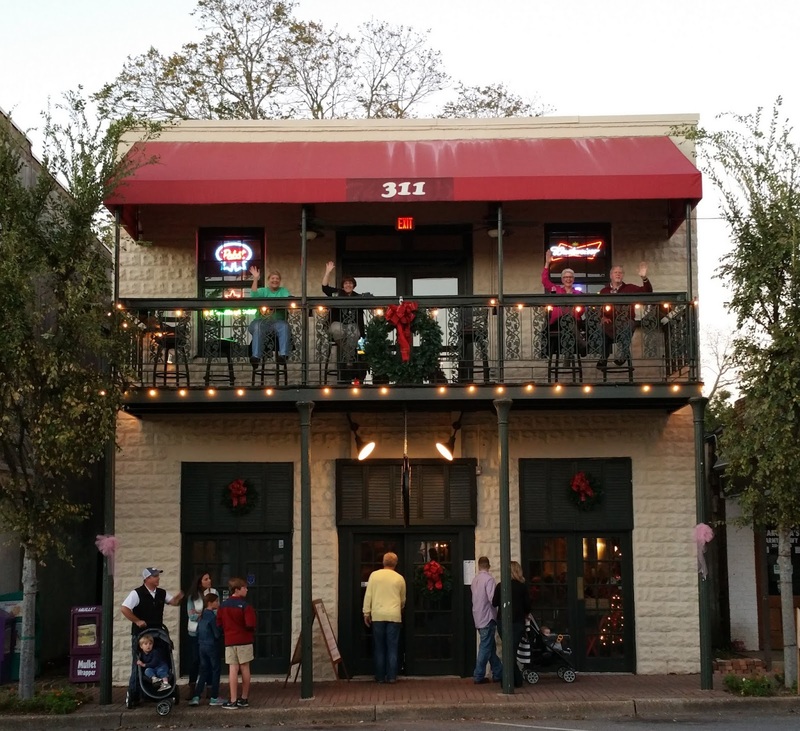 It was in one of the Fairhope gift shops I learned of the tree lighting celebration scheduled for that night. This will not be a lighting of a single Christmas tree. Instead, Fairhope strings lights in all the downtown trees and at dark, someone throws a switch and all the trees light simultaneously. That seemed like a pretty cool thing to see so the six of us hung around waiting for dark. Downtown Fairhope began getting crowded -- really crowded, a couple of hours before dusk. More selfie practice as evidenced by my tongue sticking out. Trying hard to get it right. Yes, we were photobombed by the guy in sunglasses back there. We found a nice looking little two story bar and made our way (Ozzie and Lexie in tow) up the stairs to the second floor balcony where we had libation and chatted with others around us. First to the balcony, Wayne and I proved we could get two little dogs in a stroller up the steps for a bird's eye view. 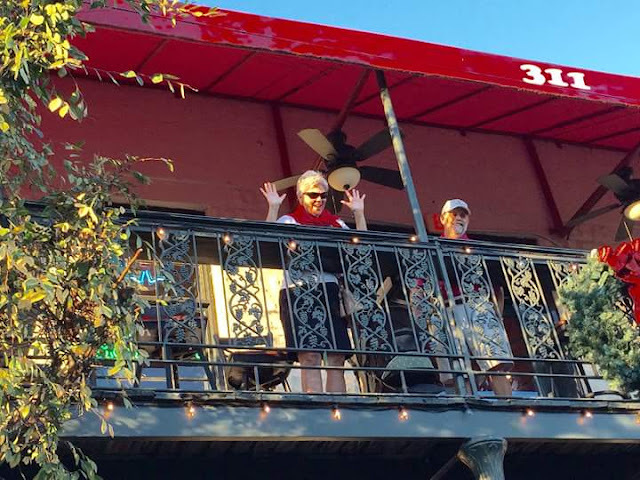 Waving goodbye to the friends we left on the balcony. By the time night fell, the streets were filled with people and Christmas sounds. All this and it's not yet Thanksgiving. Cool night air replaced the warm sun of mid-day but we were warm enough in whatever we could find to put across our shoulders. 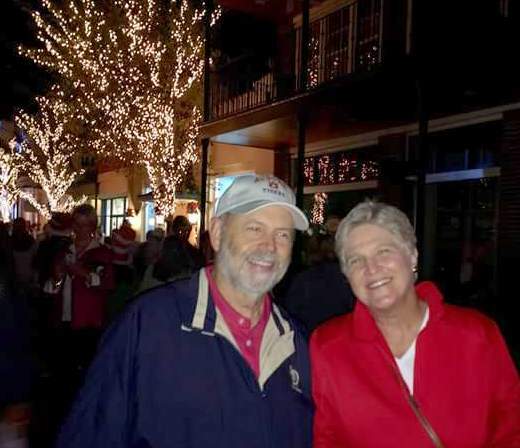 Downtown Fairhope, Alabama just after the tree lighting. 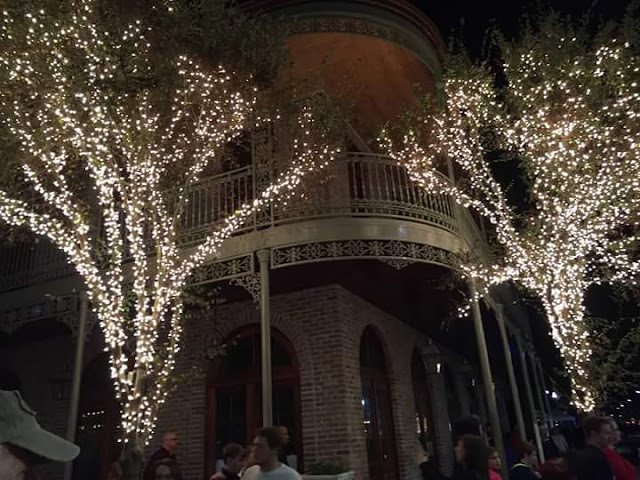 Then came the magical hour (I forgot what time) and lighted trees were everywhere. Tiny bubbles were blown into the lighted night sky. It resembled snow... well... kind of anyway. Wayne and me. Thanks for the photo, Pam. There were other things we wanted to see and do in the area. With the tree lighting, wet didn't have time to do them so it we all agreed to return another day while we're still in Gulf Shores.